The Alumni Community Service Award is given annually to an alumnus or alumna who has demonstrated distinguished leadership and commitment to serving the community in which they live or work. The award recognizes the values of service and civic responsibility that are fundamental to a Bates education. 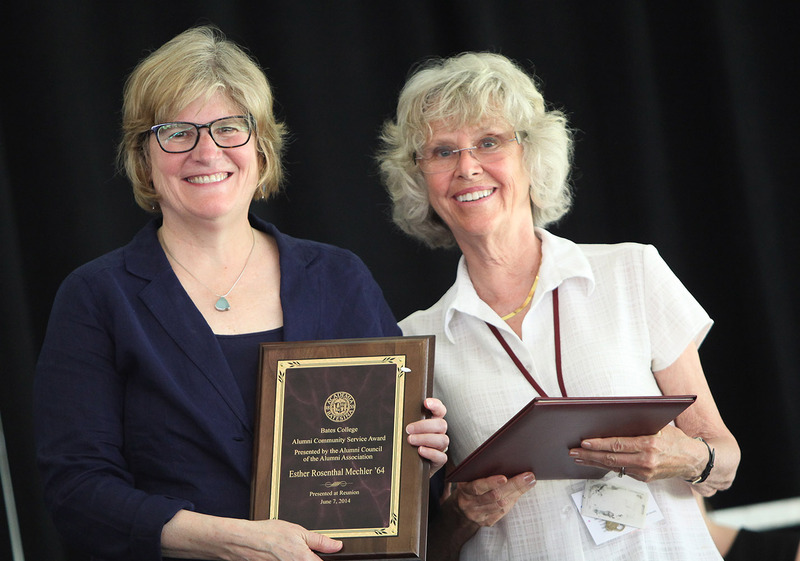 This year the award was presented to Esther Rosenthal Mechler ’64 at the Annual Gathering of the Alumni Association on June 7, 2014, by President Clayton Spencer and Jennifer Lemkin Bouchard ’99, president of the Alumni Association. Mechler was joined by fellow award recipients William “Chick” Leahey ’52 (Papaioanou Award for Extraordinary Service), Christian Rogers ’04 and Katherine Papadonis Rogers ’04 (Distinguished Young Alumni Award), and, receiving Bates’ Best awards, Elizabeth Metz McNab ’64 and Victoria Wyeth ’01. Many of us share our homes with dogs, cats and other family pets. But for every animal who finds its “forever home,” countless others are discarded at shelters and along roadsides throughout the country. For decades, millions of these unwanted cats and dogs were euthanized in shelters across the country. Enter Esther Mechler. Esther has worked for decades to ensure that every animal is a wanted animal, and through her advocacy she has helped change the face of animal welfare programs around the world. Her deep sense of responsibility and compassion for animals has made her a leading advocate for low-cost spay and neuter programs, tackling the problem of animal overpopulation at its source. This passion has been a defining part of Esther’s life from an early age. When Esther was young, her father brought home a pair of kittens from work for her sister Marian. Marian grew up with these kittens and was devoted to them. Sadly, Marian died of cancer at a young age, but her love of animals inspired Esther to found Marian’s Dream, a foundation that provides philanthropic support to programs aimed at ending pet overpopulation. That was in 1981. Since then Esther has founded or co-founded nine animal welfare programs. Most notable among them is Spay/USA, the nation’s first and largest spay and neuter database, which serves as a model for similar services throughout the country. Her leadership of and knowledge in animal welfare organizing has taken Esther around the world as a consultant to hundreds of start-up spay and neuter programs. For this work she received the inaugural Geraldine R. Dodge Humane Ethics in Action Award in 1995. Esther retired from Spay/USA in 2008 but continues to serve as president of Marian’s Dream. She is also a member of the advisory board for SpayFIRST!, and organizes and speaks at various conferences each year. Indeed, they have been working: Thanks to Esther and her fellow advocates, the number of animals killed in U.S. shelters has gone from 12.5 million in 1990 to about 3 million today. With Esther around, we are confident those numbers will continue to shrink. One of her classmates once described Esther’s warm smile and the joy she bring to others. Today we see that her smile shines just as bright as it did 50 years ago — perhaps even brighter. Esther, you have dedicated a lifetime of service to the creatures so many of us cherish as companions. You have improved the quality of life for countless animals and their humans. For your passion and conviction, it is an honor to recognize you with the Alumni Community Service Award.